The 2012 Gretsch Showcase at NAMM was star-studded, both with the musicians that stopped by the booth at the Anaheim Convention Center and the instruments that were on display. The first thing that stood out was artist Sarah Gallenberger’s amazing one-of-a-kind “Platinum Galaxy” guitar, which featured her intricate artistry. But there was much more to delve into, which many artists did. – Benji also brought up Everclear frontman Art Alexakis to meet with artist relations representatives. When he was in the Gretsch booth, Alexakis took some time checking out Tim Armstrong’s signature model. The trio took a photo with Rancid bassist Matt Freeman, as well. – Legendary finger-style guitarist Doyle Dykes brought a Gretsch guitar out on stage during one of his several performances. – Brandon Campbell of Neon Trees took out his beloved Gretsch White Falcon bass for some up-close-and-personal pictures amid the bustle. – Cousin Harley’s Paul Pigat played a rousing 15-minute set that had the near-capacity crowd boogieing along with the rockabilly tunes. – Nik and Sam, an all-female duo, turned in two performances at the stage of the Gretsch Showcase, bringing their brand of country-rock to the masses. – Ed Roland of Collective Soul and the Sweet Tea Project also offered two live sets from the Gretsch Showcase, where he also strummed a red Rancher. – Australia’s Joe Robinson smoked through a few songs off his latest album, Let Me Introduce You. The young guitarist then passed out copies of the CD and signed autographs after all three of his shows. – The Cult’s Billy Duffy, another White Falcon player, was spotted around the booth. – Grammy-winning guitarist Duane Eddy was a stalwart, taking countless pictures with fans all weekend and participating in two autograph signings. 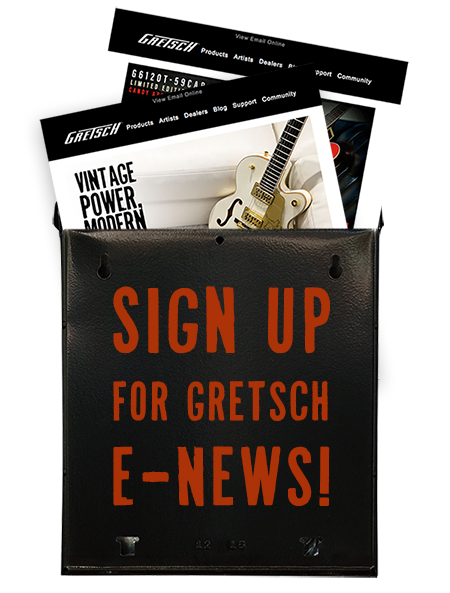 For more photos, visit Gretsch’s official Flikr account.